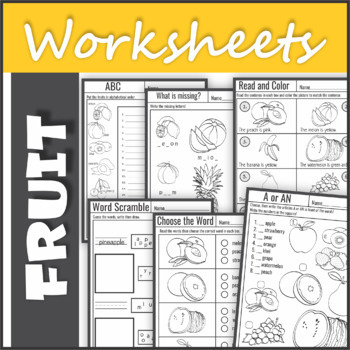 These worksheets can be used to help students practice recognizing, reading and writing common fruits. • Read and Color - Read the color and color the fruits. • Articles - Grammar detective - Copy the words, then guess the rule. - Cut and paste the correct words to each group. • Beginning Sound - Which letter does the picture start with? This worksheet provides letter recognition. • Word Scramble - Word scrambles help improve vocabulary and spelling. The letters of each word are mixed up and students have to put them into the proper order. 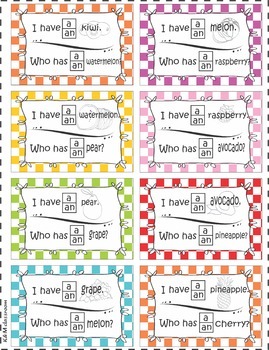 • Fruits Labels - Label each picture with its name. 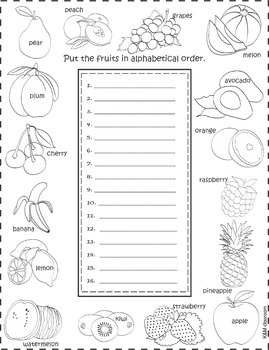 • Trace the Words - These worksheets have a picture of each fruits and a place to trace each word! • Missing Letters - Write the missing letters! • Big or Small? - Learn the adjectives 'big' and 'small'. 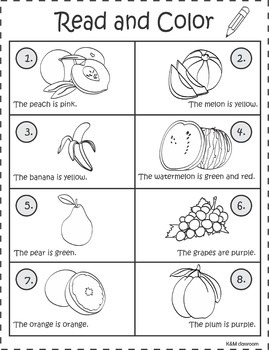 The worksheets includes all the fruits, which can be described using the targeted adjectives. • Roll and Write - Roll a die and write the word. • I have / Who Has - It is easy-to-play game that is a great way to practice essential language concepts with the whole class. This packet includes the following fruits: an apple, a pear, a plum, grapes, a kiwi, a banana, a watermelon, a melon, a cherry, a raspberry, a strawberry, a pineapple, an avocado, an orange, a lemon, a peach. Save money on your future purchases, provide feedback and earn TPT credit (My Purchases page, Provide Feedback button).